When I came across Blank, I was intrigued by the combination of three thing that I love – graphic novels, crime stories, and social media. So I had to interview the creators, Ian Lewinter and Don Richmond. We are the Brothers of the Silence, creators of Blank – The Graphic Novel. Ian LeWinter is the writer and creative strategist. Don Richmond is the writer/illustrator and creative strategist. We come from a visual media background. We met and 2006 and decided to launch Blank in May 2009 as the first graphic novel in history to launch on Facebook and Twitter. Why did you decide to write a comic book? Graphic novels are currently, without a doubt, a mega-burgeoning market. Society is poised for a new age in graphic novels. These are exciting times. There are people entering this arena who will amaze and inspire beyond our comprehension. Publishers are recognizing this fact and expanding their labels. Fans are what this market is all about and they are driving the generation of the most creative work seen in decades. We’re going to Comic-Con this week and we can’t wait to see the brilliant projects. We’re like kids in a candy store. Our schooling was that shared experience everyone has: life. Some brains collect formulas. Some brains collect algorithms. Our brains collect art — whether in words, in visuals, or in sounds. Because of this, our interest in graphic serials began the first moment we touched one. The promise of creating a world in which we can communicate the unique patterns we see in life was and still is the most important discovery we ever made. So graphic novels were a natural medium for us to explore. Why did you decide to make it available online? An apocalyptic end of the world series by Webserials. …One thing is becoming increasingly clear, while more people are “snacking on Internet video“, the real “meal” continues to be TV….Events look great on HDTVs, whether they are sports, shows or movies. Quick hits and short clips are great for the internet. Sure some people will watch shows that perform better on other platforms on the net. We all use what we have available when its our only choice. Which is why so much video consumption online is in the office. Its our only choice. Replays and breaking news and anything that helps us kill time are what we will use our MIDS, PDAs, and phones for. The platform is the message from viewers to content providers. Reading his post made me think about the basics. In the past, TV and TV set were the same thing. You couldn’t watch TV shows, unless you had a TV set. TV sets where connected to a broadcaster which in turn provided content to TV sets. Today the situation is different – you can buy TV shows in iTunes, or watch them online. Therefore, TV, at least for me, is a creative definition. The Wire is great TV. Olympics is a great TV event. But I can watch these events and shows on different devices – computers, HDTV sets, iPods, etc. TV set is still the best way to watch long form content. It is the closest thing to movie theater you can get. Events, movies and high end shows will always look better on that set. Internet – Distribution or Format? The internet changed its form over the years. It is true that internet videos are short – as users tend to view them in short breaks in work, and due to the form factor (small screens). But when I connect my laptop to my TV – there is no difference in the experience . Therefore there shouldn’t be any difference in the format. And when online video becomes another part of the EPG, who cares where did the content come from? When AppleTV can deliver both high end movies and low budget indie flicks directly to your TV through the Internet – what is the platform? Is it TV or Internet? Like in every vision, the missing link is a business model. In my opinion, if online distribution and monetization would have been profitable enough, we would have seen more direct to internet TV quality shows. As long as the average online video CPM is 12$, nothing will change the current level of Internet originated productions. But I am positive that things will change as ad dollars are going online. Daisy Whitney‘s “new media minute” is a great resource about online video. I love this episode especially, as it stars key videobloggers (including Kent Nichols from Ask A Ninja, and Steve Garfield), who give their advice for succesful videoblogging. 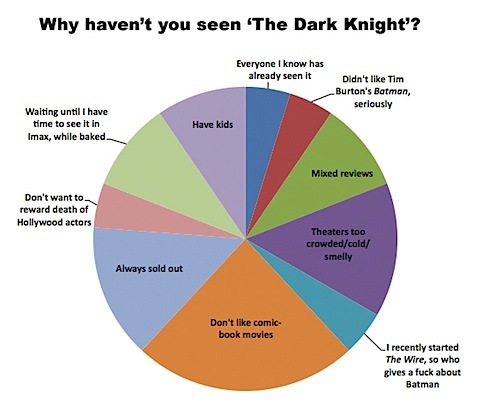 Why Haven't You Seen The Dark Knight?